So, it’s that time of year again when the clocks go back, the nights draw in and there is a definite chill in the air. Well actually if you work in our brewery not only is that chill in the air its in the whole brewery as well. Keep moving to keep warm is our motto! But I digress. It’s also that time of year when brewers start to think about winter ales. Obviously, we already have a winter favourite – our dark Winter Porter, complex and warming it is truly established as a firm favourite for winter – indeed in the same way as a certain crème egg seems to stretch the spring season our porter keeps getting requested by pubs earlier and earlier. However, we also understand that not everyone is a fan of dark beers, but do like to try something different and seasonal. So, we will be introducing a winter season ale which is packed with complex winter flavours but will be copper in colour to appeal to a wider range of people. 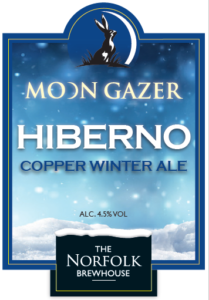 As for its name – it is called Moon Gazer Hiberno – pronounced High Burr No. Ok, it may be a wee bit highbrow as it is Latin for Winter Season – but to be honest we just liked the sound of it and the name has stuck – hopefully it will with you too. It will be a balanced hoppy chestnut coloured beer infused with Norfolk country garden fruits – think blackberries – supported by a delicate hint of orange a lemon. Not quite a classic Christmas fruit cake but you get the idea. Do please look out for it from mid November.